1919: Launched by Isaac Pimblott & Sons Ltd, Northwich (Yd.No.357) (“Admiralty drifter”) for The Admiralty as STERN WAVE (Ad.No.4185). 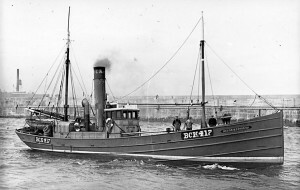 27.3.1920: Completed as a fishing vessel. 25.8.1920: Transferred to The Fishery Board for Scotland, Edinburgh for disposal. 1921: Sold A. Wares & C. Cluness, Newhaven, Edinburgh. 1922: Registered at Leith as CRAIGLEITH (LH255). 1922: Sold to Scottish Steam Herring Fishing Co Ltd, Peterhead (John Sutherland, manager). 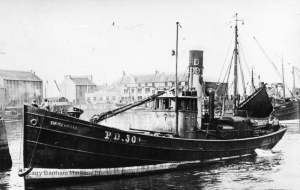 1922: Registered at Peterhead as SUMMER ROSE (PD594). 1930 – 1936: Trawling out of Fleetwood (Alex Keay, managing agent). Pre 1937 sold to Scottish Steam Herring Fishing Co Ltd, Peterhead & Others. 1937-1939: Occasional landings at Fleetwood when white fish lining (Alex Keay, managing agent). 1.10.1939: Requisitioned for war service as a minesweeper (Hire rate £32.0.0d/month). Based North Shields (Ty/Sk. W. Howes RNR). 13.10.1940: Mined off Sunderland. Two crew lost. 24/92/2010: Page published. 5 updates since then. This entry was posted in Drifter/Trawler, Steam Trawlers, War Losses and tagged Admiralty Drifter, Alex Keay, Drifter/Trawler, Lost, War Loss on February 24, 2010 by Fred Smith. 1918: Launched by A. Hall & Co Ltd, Aberdeen (Yd.No.555) (“Admiralty drifter”) for The Admiralty as FROTH (Ad.No.3978). 25.10.1918: Completed as a minesweeper. 1920: Transferred to Board of Agriculture & Fisheries, London for disposal. 1921: Sold to Herbert Pritchard, Liverpool. Registered at Liverpool as FLORENCE PRITCHARD (LL120). 1923: Sold to T. W. Dixon, Whitehaven. 1923: Sold to George Rogers, Douglas, IoM (managing owner). Liverpool registry closed. Registered at Douglas as MANX PRINCESS (DO91). 1932: Sold to John Murray, Buckie, E. Murray, Findochty & J. R. E. Logie, Buckie (John Murray, managing owner). Registered at Buckie (BCK118). 1933: Douglas registry closed. Registered at Buckie as EUNICE AND NELLIE (BCK118). 1935-39: Trawling from Fleetwood (Alex Keay, managing agent). 5.12.1939: Requisitioned for war service as a minesweeper (P.No.FY1543) (Hire rate £32.16.0d/month). 3.1943: Employed on miscellaneous Naval duties (TRV). 1946: Sold to Alexander Reid, Dorothea Thomson & Others, Peterhead. Buckie registry closed. Registered at Peterhead (PD309). 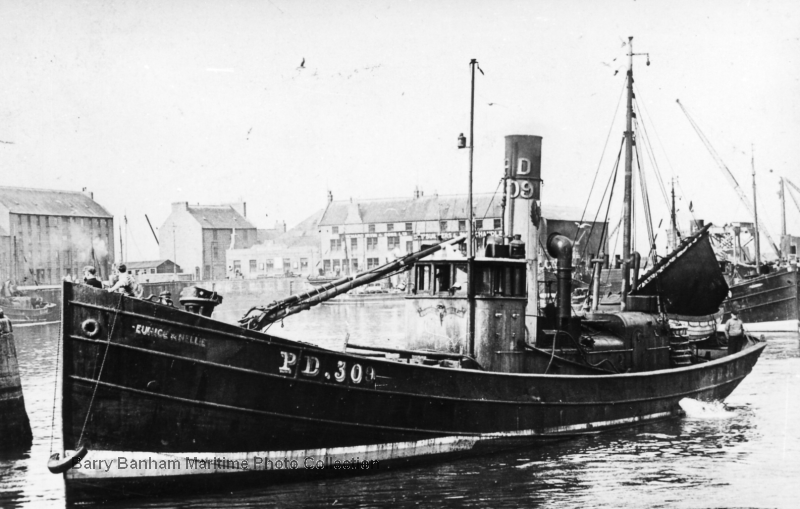 1947: Sold to Drifters (Peterhead) Ltd, Peterhead (G. G. Strachan & Others & Caledonian Fishselling Co Ltd)(R. Foreman, manager). 1954 (17.12.1952): Sold for breaking up. 18/02/2018: Removed FMHT watermarks from images. This entry was posted in Seasonal Visitors, Steam Trawlers, Steamers (Picture) and tagged Admiralty Drifter, Alex Keay, No Fleetwood owners, Seasonal on January 26, 2009 by Fred Smith. 1907: Completed by Smith’s Dock Co Ltd, North Shields (Yd.No.345) for Smith’s Dock & Trust Co Ltd, North Shields (Archbald Miller, Gt Yarmouth, manager) as TWO. 6.6.1907: Registered at Yarmouth (YH211). 1.1915: Requisitioned for war service as an A/S net drifter (Ad.No.1049). 29.7.1920: Sold to West Country Fishing & Curing Syndicate Ltd, Falmouth (John A. Collett, London, manager). 17.5.1921: Sold to Fish Traders Ltd, London (Andrew Robertson, Aberdeen, manager). 12.1922: Sold to James, John & William Smith & J. Farquhar, Portessie, Buckie (William Smith managing owner). 1.1923: Registered at Buckie as CORIEDOUNE (BCK417). 1926: John Farquhar, Buckie managing owner. 1935: Sold to Alex Keay, Fleetwood (managing owner). 1949: Sold to Joseph Duthie, Fraserburgh. 29.7.1949: Registered at Fraserburgh (FR481). 2.8.1949: Condemned. Fraserburgh registry closed. Sold for breaking up. 22/01/2009: Page published. 4 updates since then. This entry was posted in Drifter/Trawler, Steam Trawlers, Steamers (Picture) and tagged Alex Keay, Drifter/Trawler on January 22, 2009 by Fred Smith. 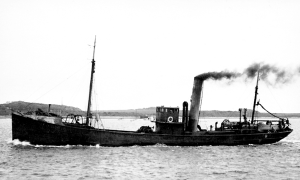 24.9.1907: Launched by Cochrane & Sons, Selby (Yd.No.421) for William Jenkins & Isaac J. Jenkins, Milford Haven and James Hier, Neyland as DEWSLAND. 28.11.1907: Registered at Milford (M220) (William Jenkins managing owner). 11.12.1913: Manouvering in dock at Milford damaged stern, bulwarks and mizzen boom. 5.1915: Requisitioned for war service as a minesweeper (1-12pdr) (Ad.No.2664). 2.6.1915 Off Scilly Isles, picked up ten crew members of DELTA B (O171) sunk by U34 and landed them at St. Mary’s. 10.4.1919: Sold to Maurice Wilkins & George Moreland, Manchester (c/o Joseph A. Taylor, Fleetwood, manager). 1.1921: Transferred to Aberdeen (Sam Isaacs (Aberdeen) Ltd, managers) on charter to Bookless Brothers, Aberdeen to operate from Hafnarfjordur, Iceland, ‘salting’. 15.3.1923: Sold to Gerald Kelton, Dunsfold, Surrey (William F. Goodwin, Grimsby, manager). 11.1925: Sold to John Wm. A. Potts & Lars J. Larsen, Fleetwood (trading as Ples Steam Fishing Co Ltd, Fleetwood (William A. Stonebanks, manager)). 9.11.1925: Registered at Fleetwood (FD64). 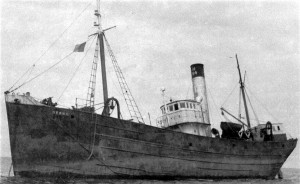 12.2.1927: In dense fog stranded in Wyre channel. 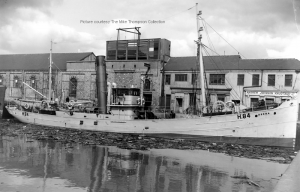 1928: Trading as Dewsland Trawlers Ltd, Fleetwood (William A. Stonebanks, manager). 27.10.1933: Fishing off Tiree on hauling in gale force winds trawl became entangled with propeller. Put in to Oban. 28.10.1933: Divers cleared propeller. Sailed Oban but shortly afterwards steam pipe fractured and returned to Oban for repair. 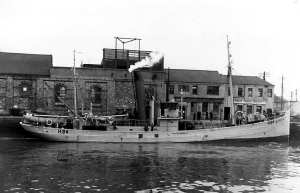 16.11.1933: Sold to Stanley Steam Fishing Co Ltd, Rochdale (James Brierley, Rochdale, manager). 31.3.1937: Sold to G. Rollinson & Co Ltd, Manchester. 31.3.1937: Sold to Alexander Keay, Fleetwood. 31.1.1941: Sold to J. Marr & Son Ltd, Fleetwood for £6500. 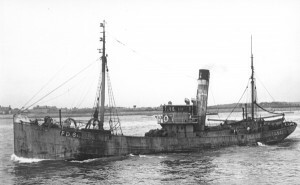 13.6.1944: Sold to Hull Merchants Amalgamated Trawlers Ltd, Hull for £12000. 6.7.1944: Registered at Hull (H84). 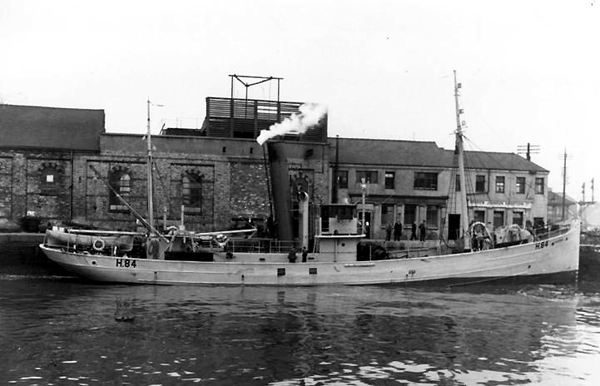 24.12.1945: Registered at Hull as DERNA (H84). 24.11.1947: Sold to East African Fisheries Ltd, Dar-es-Salaam, Tanganyika Territory (Charles C. Johnston, London, agent). 29.6.1951: Sold to Harold G. Lewis, Mombasa, Kenya. 29.06.1951: Sold to Harold G. Lewis, Mombasa, Kenya. 22.8.1951: Sold to Lamer Line Ltd. Mombasa (Harold G. Lewis, manager). Used as cargo vessel between Mombasa and Tanga. 22.7.1954: Grounded on Niule Reef outside Tanga with cargo of petrol in cans. 27.8.1954: Salved and towed into Tanga for discharge. 14.9.1954: Sank at moorings at Mtongwe, Mombasa. No salvage attempted and abandoned. 22/01/2009: Page published. 3 revisions since then. 10/06/2017: Removed FMHT watermarks from images. 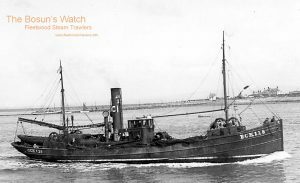 This entry was posted in Lost Vessels, Steam Trawlers, Steamers (Picture) and tagged Alex Keay, Dewsland Trawlers Ltd, Lost, Marr, Ples SFC Ltd, Wilkins & Moreland on January 22, 2009 by Fred Smith. 23.7.1907: Launched by Smith’s Dock Co Ltd, North Shields (Yd.No.353) for Crawford Heron, Swansea as the LOUISE. 8.1907: Completed. Registered at Swansea (SA50). 3.9.1907: Registered owners, Mrs Marion L. Ryde, Godalming & Colonel Arthur T. Sloggett, Paignton (Crawford Heron, Swansea, manager). 13.3.1913: Sold to George H. D. Birt, Milford Haven (managing owner). 4.6.1913: Mortgaged to Henry H. Hextall. Eastbourne (A). 8.1914: Requisitioned for war service. 22.1.1915: Arrived Devonport. Fitted out as a minesweeper (1-6pdr). Fitted as Leader. Admiralty Number became (Ad.No.965). 25.5.1917: Sold to Taylor & Tomlinson Ltd, Fleetwood (Ernest Taylor, manager). 25.5.1917: Mortgaged to The London Joint City & Midland Bank, London (B). 1.4.1919: Registered at Fleetwood (FD120). Based Granton. 1920: Returned to owner at Fleetwood. 1920: Sold to M.J. vander Eb & Dresselhuys, Scheepvaart Maats, Rotterdam (J. Nierinck, Ostend, manager). 2.1920: Registered at Ostend as BARON L DONNY (O203). 5.10.1922: Sold to Jules H. Nierinck, Blackpool (managing owner). 5.10.1922: Registered at Fleetwood as ALEC NIERINCK (FD414). 1925: Sold to Melling Trawlers Ltd, Fleetwood (Henry Melling, manager). 15.9.1925: Registered at Fleetwood as TOM MELLING (FD414). 1932: Sold to Alexander Keay, Fleetwood (managing owner). 19.1.1932: Registered at Fleetwood as BAHAMA (FD414). 31.1.1941: Sold to J. Marr & Son Ltd, Fleetwood (Geoffrey Edwards Marr, manager) for £7500. 4.5.1942: Sold to The Crampin Steam Fishing Co Ltd, Grimsby (H. G. Crampin, manager) for £8600 (Fleetwood based). 3.1945: Sold to Pettit & Youds Ltd (Frank L. Youds, manager), Milford Haven. 11.10.1945: Outside the dock at Milford waiting to proceed to sea, Jack Lyons, fireman fell overboard and drowned. 7.11.1945: On a trip to SW of Ireland grounds (Sk. Cherrington). In bad weather stranded on rocks off Berehaven Island. Refloated on next tide with little damage. Returned to Milford. 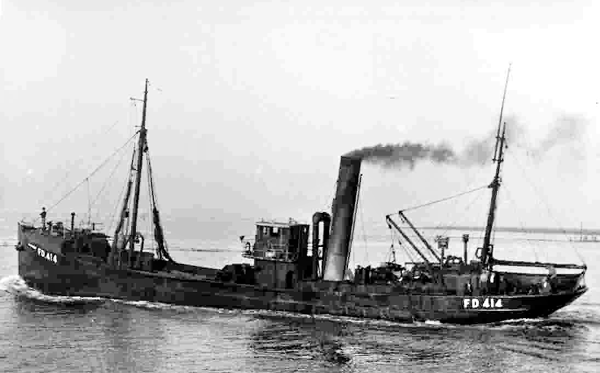 16.4.1949: Outward for fishing grounds (Sk W. Reynolds), in thick fog off St. Ann’s Head in collision with steam trawler P & Y (M1). Returned to Milford for repairs. 19.4.1949: Sailed on completion of repairs. 22.8.1956: At Milford Sessions, Sk. Victor Thomas was charged with failing to ‘return to the sea’ 26 stone of undersized haddocks. He was fined £5 and ordered to pay 1gn costs. 24.7.1956: Sold to Brugse Scheepsloperij (Jacques Bakker en Zonen, Bruges) for breaking up. 19/01/2009: Page published. 4 updates since then. This entry was posted in Steam Trawlers, Steamers (Picture) and tagged Alex Keay, Marr, Melling ST, Taylor & Tomlinson on January 19, 2009 by Fred Smith.